I was drawn to the California Sea Grant State Fellowship in part to increase my exposure to diverse stakeholders engaged in marine resource management, broaden my perspective on alternative career paths in marine conservation, and expand my professional network. Many of the host agencies are located in Sacramento or the Bay Area, and the opportunities for developing a network that come from being in close proximity to other fellows and many resource management agencies are appealing. Although Santa Barbara is more isolated geographically, a fellowship with the National Oceanic and Atmospheric Administration (NOAA) Channel Islands National Marine Sanctuary also affords such opportunities. The Channel Islands National Marine Sanctuary is located off the coast of Santa Barbara and Ventura counties in California and encompasses 1,110 square nautical miles (1,470 square miles) of water from mean high tide to six nautical miles offshore of Santa Barbara, Anacapa, Santa Cruz, Santa Rosa, and San Miguel islands. Image: NOAAThe Channel Islands National Marine Sanctuary (CINMS) is one of fourteen national marine sanctuaries located across the country. These underwater parks are places where government, academic and citizen scientists work collectively to enhance our understanding of natural resources. Partnerships and collaboration are essential to accomplishing research, monitoring, and resource management within sanctuaries. By engaging with existing partners, as well as forging my own relationships, I have dramatically expanded my professional network. In addition to interacting with these members over council meetings, I met with some for informational interviews to learn more about their career and the agency or organization they represent, and even engaged some to help with several island beach cleanup events sponsored by CINMS. A whale appears close to a container ship. Photo credit: John Calambokidis/Cascadia ResearchI have also worked with local agencies, other sanctuary sites, other branches of NOAA, foundations, and the shipping industry through my role with the Vessel Speed Reduction incentive program. The program is designed to slow commercial ships down along the California coast to reduce the risk of fatal strikes to endangered whales and improve air quality by reducing local emissions. My involvement included developing program parameters with partners, communicating these to shipping companies, evaluating their cooperation, and planning an awards ceremony and positive public relations campaign at the conclusion of the program. Images from an inter-agency dive trip to San Clemente Island to search for endangered white abalone. Images: Lindsay MarksFinally, I have worked on a collaborative project to restore endangered white abalone in Southern California. 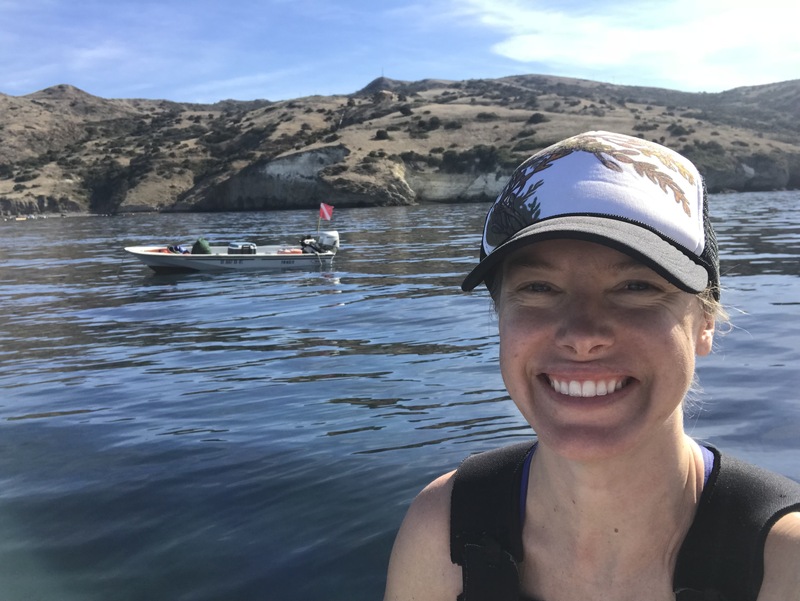 I joined several cruises to look for wild populations of white abalone around the Channel Islands and in San Diego, and participated in a workshop to develop a plan for outplanting captive-reared juvenile abalone into the wild. Through this work, I met researchers and conservation practitioners from NOAA Fisheries, National Park Service, Santa Monica Bay Foundation, Paua Marine Research Group, Scripps Institution of Oceanography, and the California Department of Fish and Wildlife. In summary, fellows placed with the Channel Islands National Marine Sanctuary will learn about marine policy and conservation from not only this host agency, but also from the many partners and collaborators who work with the sanctuary to study and protect this special place and its inhabitants. These experiences and the relationships built during the fellowship provide a broad perspective on marine conservation and help fellows develop a diverse professional network that will serve them well throughout their careers.